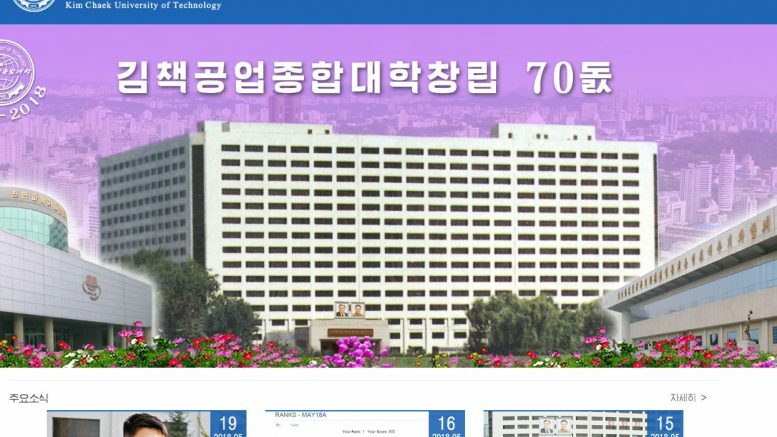 One of North Korea’s top universities, Kim Chaek University of Technology (김책공업종합대학), has launched a site on the global Internet. The new web site, at www.kut.edu.kp, appears to have debuted to coincide with the 70th anniversary of the university this year and an international conference to mark the event in September. It’s the second state-run North Korean university to have an Internet home page after Kim Il Sung University. Kim Chaek University (KUT) is a leading school for technology and its professors and students have been credited with numerous inventions or developments. It has been active on the international scene for sometime and enjoyed a multi-year research collaboration with Syracuse University in the U.S. on work that included development of a digital library system. It turns out some of the best computer scientists in North Korea. The continued high ranks of KUT students in the Code Chef international online programming contest is highlighted on the new website. In May this year a student, Kim Song Il, scored maximum points in a Code Chef contest and KUT students have ranked highly for the past several years. KUT is one of the destination schools for North Korea’s best computer science prospects. After being identified earlier in their school careers, they are weeded out through high school programming contests and the best end up at KUT, Kim Il Sung University or the military-run Mirim Academy. The education page of the North Korean Website List has been updated to include KUT.